MIDDLEBURG, Va., Aug. 8, 2014 – Decision Sciences International Corporation (DSIC), an advanced technology provider of security and detection systems, today announced it has been awarded a contract by Toshiba Corporation (Toshiba) to support the reclamation of the Fukushima Daiichi Nuclear complex with the use of DSIC’s revolutionary muon tracking detectors. Under the initial contract, DSIC will design, manufacture and deliver a detector and tube arrays that fit into the power plant building. The detector will be part of Toshiba’s overall Fukushima Complex project to determine the location and condition of the nuclear fuel inside the plant. The information provided by the detectors will assist Toshiba in developing a safe and effective remediation plan. “We are delighted to extend the application of our solution to assist in the recovery of the Fukushima power plant as well as support and secure a safe working environment for personnel,” said DSIC President & CEO Dr. Stanton D. Sloane. Muon imaging technology makes use of cosmic ray muons to determine material density and type of material scanned. Cosmic rays enter the earth’s upper atmosphere and create muons, high energy particles which naturally and harmlessly rain down on the earth’s surface. Muon tracking detectors detect and track muons as they pass through scanned objects. Subtle changes in the trajectory of the muons as they penetrate materials and change in direction correlate with material density. Nuclear materials such as uranium and plutonium are very dense and are relatively easy to find. 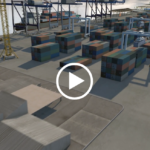 Decision Sciences has successfully deployed its Multi-Mode Passive Detection System (MMPDS) based on muon tomography technology at the Freeport Container Port in the Bahamas as well as delivered systems to customers in the U.S. and United Kingdom. For more information email: info@decisionsciences.com.